A bunch of folks from the Federation of Genealogical Societies will be setting sail at the end of next week for a visit to the northernmost part of the United States — and parts of Canada — in a first-ever FGS cruise to Alaska. And if you think The Legal Genealogist is excited about this trip, you haven’t met my older sister, who is coming with me. She’s never been to Alaska before, and never been on a cruise before, and may not sleep the entire time for fear of missing something. What I don’t want to miss are the bits and pieces of history — and of legal history — that go into making Alaska one of the most fascinating parts of our national lore, including that amazing bit of history we all heard about in school, called Seward’s Folly. Russia offered to sell Alaska to the United States in 1859, believing the United States would off-set the designs of Russia’s greatest rival in the Pacific, Great Britain. 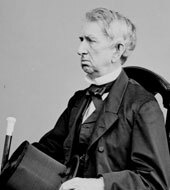 The looming U.S. Civil War delayed the sale, but after the war, Secretary of State William Seward quickly took up a renewed Russian offer and on March 30, 1867, agreed to a proposal from Russian Minister in Washington, Edouard de Stoeckl, to purchase Alaska for $7.2 million. The Senate approved the treaty of purchase on April 9; President Andrew Johnson signed the treaty on May 28, and Alaska was formally transferred to the United States on October 18, 1867. This purchase ended Russia’s presence in North America and ensured U.S. access to the Pacific northern rim. Any or all of these provisions may impact us as family historians if our roots run deep into this northern land. Have a great time. I lived in Alaska 30 years and enjoyed every minute of it. Lived in Kodiak (as a child), Sitka (college), and Ketchikan. Thanks, Roger! I’ve been in Alaska twice — once to see the Northern Lights and once to take pictures of eagles. I’m sure looking forward to the return trip — and my sister is so excited for her first trip~! Is there a word that eclipses “excited” ? I cannot wait to experience the adventure that is Alaska AND be able to attend the presentations offered by the well known and well respected speakers on this cruise! I could not ask for better! If you stop in Anchorage, look me up, I’d love to discuss research and the sights in Alaska. No stops in Anchorage this time, I’m afraid! I signed up for this trip early on, having never been to Alaska, never been on a cruise, and never been to a genealogical convention. I’ve been reading for months, history, the gold rush, natural history, women in Alaska, Alaskan birds. Now my doctor tells me I can’t go. I’m terribly disappointed. Alaska will be there, but when will FGS do another cruise from Seattle, where I live, to Alaska?? The only consolation is that I bought trip insurance. Well, drat! That’s really disappointing, Doris! I can’t imagine how you must be feeling. I forgot to say I was really looking forward to meeting you and taking some of your classes in person. Not this time. Maybe there will be a next time. I’ll keep my fingers crossed for a next time, Doris.